Midtempo punk sounds like such a boring idea. And sometimes it really is. But when it works, it’s hard to top. The chords are still powerful and concise, the frustration and fury still present, but it’s more tempered when the tempo drops down a bit and more powerful when it rises to the top. The vocals need to sneer and snarl instead of shout. It’s that ability to balance emotion with aggression and uncertainty that sets Arms Aloft ahead of the pack. They’re absolutely a punk band through and through. It’s DIY at heart, super cynical, and built around the cusp of just-contained emotion, but it’s also carefully structured with rising and falling power within each song instead of full-throttle fury. What A Time to Be Barely Alive is their second album and, though some time has passed since Sawdust City, the sound and cynicism has not. This album is a little more universal in tone but that’s no surprise for a band who spent three years driving the planet’s highways instead of working unsatisfying jobs in a mid-size Wisconsin city. “Untitled” is typical of their sound, and “Slosly Is Playing at My House” is among the standouts. Both are also good examples of how Arms Aloft has an easily identifiable sound that still manages to sound unique from track to track. Seth Gile’s voice is emotive and descriptive in delivery but is more or less the same key throughout the record. He uses that limitation to good effect, twisting and turning his delivery to match the forceful guitar lead in the song while punching in lyrics that fit the same tone. “This machine kills my bad dreams,” he sings in “Slosly…”’s close. It’s alternately a familiar line but with a twist and a true message behind it. It ingrains in the memory and intrigues in the brain. Where many bands lament, Arms Aloft explore. Their sound really has a distinct thoughtful tone that plays out through Gile’s vocal style. He doesn’t belt out gruff lyrics with a tallcan in the air, but spits them with an ebb-and-flow narrative that feels more like a story and a lesson (or a reflection anyway) than a two-minute blast of relief from a weary world. 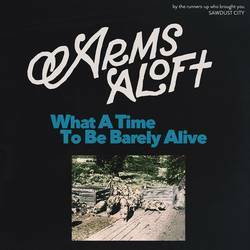 The half-hour spent with an Arms Aloft record isn’t a party with like-minded friends seeking escape, it’s more like a heart to heart talk that covers some seriously heavy topics but leaves you feeling relieved at the end, justified instead of just grumbling or blocking out the world’s problems. Posted Nov. 21, 2016, 7:22 p.m.
Posted Nov. 16, 2013, 9:42 a.m.
Posted Feb. 2, 2019, 12:07 p.m.
Posted Aug. 22, 2016, 5:17 p.m.